You can get fancy with the time controls in NET USER if you like! 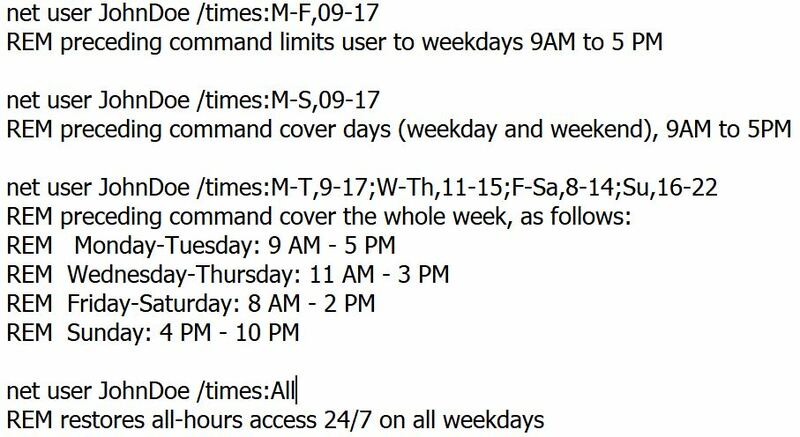 Some of the niggling syntax details aside, it’s simply a matter of specifying day of week and time window to limit user hours with this command. You can use either 24 hour values for time ( from 0-24, with 01 for 1) or 12 hour values to which you must add AM or PM (1AM, 6PM. The days of the week may be spelled out, or abbreviated as M (Monday), T (Tuesday), W (Wednesday), Th (Thursday), F (Friday), Sa (Saturday) and Su (Sunday). For the complete skinny on this command, check out the Command Line Reference entry for “Net user” online. Levity aside, there’s a lot of power and capability in the Net commands for Windows. Thus, I will probably find myself returning to them from time to time. Next up, in fact, will probably be the network shell, aka Netsh. Stay tuned!